Millions of people work outside a typical office setting. In many cases, they use inefficient or costly tools and time-consuming processes to collect data and complete tasks. 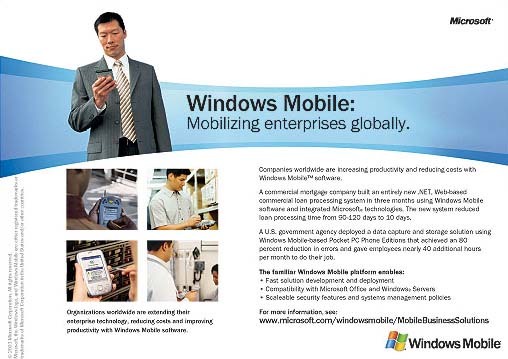 Since the introduction of Windows Mobile-based devices in 1996, mobile computing has changed to enable cost-effective solutions for mobile workers. Mobile business solutions help increase employee productivity and customer response rates while reducing business cycles and costs. Organizations have seen both qualitative and measurable quantitative business benefits – making mobile devices a more mainstream tool for enterprise solutions. Existing client/server architecture systems are being extended through Web-based applications. Many see the next step in extending the reach of these systems is to support mobile devices. This entails adapting to smaller screen sizes and different wireless connectivity options. Windows Mobile-based devices support a large number of industry standard protocols and interfaces (e.g., 802.11b, Bluetooth, GSM/GPRS, CDMA/1xRTT, SD/MMC, CompactFlash, PCMCIA, HTML, XML, SOAP, and WAP) so they have the flexibility required to integrate with a range of enterprise systems. Windows® developers are able to use a consistent set of tools and technologies when building wireless mobile enterprise solutions, reducing training costs and development time. Mobility usage started with single function devices such as mobile handsets, text pagers, bar code readers, walkie talkies, and Personal Digital Assistants. Now these functions, along with business applications, are available in converged devices with Windows Mobile software. 3 Higher capacity data storage media. For businesses that need to store a large amount of data, smaller cards with increasing storage volume are available for Windows Mobile-based devices. Access to up-to-the-minute data can save costs, speed up business processes, and build customer trust. 4 High speed wireless networks are available. Wireless bandwidth is increasing for local and wide area connectivity, which supports the higher data transfer demands of business applications such as e-mail with attachments, multimedia content, and Web services. There are multiple mobility projects that have a high probability of making a quick and substantial return on investment for organizations. Outlined below are five areas that offer significant benefits. Many enterprises that have converted a paper-based process to an electronic form-based application on a mobile device have seen data collection times reduced in the field, more accurate data flowing to central enterprise servers, and faster business reporting. The very small size of Windows Mobile-based Pocket PCs while wirelessly connected are capable of handling tasks often not possible with laptop computers. Automating data capture in this way enables more business transactions while improving customer satisfaction and reducing errors. Replacing older devices with more powerful Windows Mobile-based Pocket PCs may reduce the overall cost of ownership and provide more flexibility. The cost savings associated with modernizing legacy devices and infrastructure can be substantial. And new Windows Mobile-based devices use rewritable memory so that system software updates can continue to extend the hardware investment. In the past, Web-based solutions required time consuming and costly manual labor to adapt the core design to work on multiple types of mobile devices with differing screen sizes, screen orientation, and Web technology. Today, ASP.NET mobile controls (formerly known as the Microsoft® Mobile Internet Toolkit) provides an approach where a master Web page is created and maintained on a Web server as a form that automatically adjusts to match the screen size and technology of a large number of mobile devices. These server-side controls intelligently render content for different devices, enabling Web-based mobile applications to be deployed faster and support a broad range of devices. For mobile workers with intermittent connectivity, mobile business solutions need to be completely self-contained on a mobile device with the capability to swap e-mail, data and business transactions when connected. The Microsoft .NET Compact Framework uses the .NET Framework for PCs to enable developers to build applications that utilize Web services and run in a standalone mode on Windows Mobile-based devices. Database and transaction queuing technology is available, such as SQL Server™ CE, to reliably store and forward business data and transactions each time a device is connected to an organization’s network. For businesses monitoring metrics daily, someone needs to be notified when data points fall outside the acceptable operating range or when change happens to the organization. The longer the delay in responding, the higher the potential business cost. Windows Mobile-based devices that incorporate a phone include the capability to send and receive Short Message Service (SMS) text messages. Based on the text in the message, a user may need to make a phone call, use an application located on the device, or access a Web site. This process is one example of an organization operating like a real-time enterprise. Microsoft’s SQL Server database provides Notification Services that send out SMS text messages when internal database triggers have been activated. This infrastructure technology enables a new class of scalable Web applications that deliver personalized, timely information updates to a variety of mobile devices. For people in job roles where every second counts, this approach can result in saving lives, faster decisions with a large financial impact, or improved customer service. Benefits can be a combination of cost savings as well as new business extensions that result in additional revenue. At a time when economic conditions are severe, identifying ways to increase productivity, decrease operational costs, improve revenue generating processes, and increase customer satisfaction provide a strong justification for technology investments. Return on Investment (ROI) = Total Cost of Ownership (TCO) minus cost savings. This standard approach looks for removing costs through business process reengineering. Replacing older equipment can sometimes result in lower operational or maintenance costs that can cover the cost of a project. Many organizations track the costs of errors and know the value of reducing a percentage of these errors. Improving data capture, process management, and timely communications can provide a measurable decrease in errors that can be cost-justified. Improve efficiency and effectiveness of field sales and service personnel. Reducing administrative overhead provides more time to focus on the core job. Shortened business cycle times enable the existing workforce to get more work done. Capturing data at the source can help increase the accuracy of the data used to run an organization. Deliver the right data at the right time. Location-based services can provide information or directions to key points of interest in proximity to a mobile worker’s location. Notification services can be triggered by changes within the business or in the broader marketplace. Faster access to more accurate operational data enables more timely and informed business decisions. Providing mobile access to e-mail and other messages enables employees to utilize downtime more effectively. Timely, accurate information and integrated, automated services can strengthen relationships and provide financial incentives by avoiding switching costs. Mobile solutions show organizational investment in employees by reducing time spent on menial or repetitive tasks. Reduce carry around bulk and weight. With integrated wireless and data functionality Pocket PCs and Smartphones may be able to replace multiple devices such as a cell phones, personal organizers, pagers, calculators, cassette recorders, or walkie talkies to eliminate bulk and weight. Provide educational materials in more settings. With audio, video, Flash web technology, ebooks, and text available, different forms of training and reference content can travel along with an employee. Familiar user interface of Windows Mobile-based devices makes it easier for new users to get up and running quickly if they are familiar with PCs. Using Microsoft.NET-connected software, a global car rental company created a reusable XML Web services-based interface into its legacy system to extend access to its reservation service. As a result, the company opened another sales channel that provided millions of additional rate requests and thousands of new reservations annually, equating to millions of dollars in additional revenue. The development costs were less than 10 percent of any proposed third-party solution. An international document copying and services company extended their Microsoft .NET-based asset management to run on Windows Mobile-based Pocket PCs. The solution was completed in two months for 5,000 mobile users and eliminated error-prone pencil-and-paper recording for field technicians. One of the UK’s largest retailers employing more than 32,000 people, reduced transaction time at the checkouts by 50 percent with a point of sales solution using Windows Mobile-based Pocket PCs. One of the largest beverage companies in Hong Kong and Asia developed a mobile computing solution to enable travelling sales representatives to perform critical ordering tasks and access the corporate network while on the road. Scandinavia's leading distributor of films for cinema, TV and video as well as electronic games deployed a Windows Mobile-based solution to enable field sales people to receive information and enter orders while at retailer outlets. The solution enabled the sales force to see 20 percent more customers a day. A package pickup and delivery system converted to a wireless Windows Mobile-based system for collecting information and signatures and a server running Microsoft BizTalk® for message notification. The solution delivered a 102 percent return on investment. The information contained in this document represents the current view of Microsoft Corporation on the issues discussed as of the date of publication. Because Microsoft must respond to changing market conditions, it should not be interpreted to be a commitment on the part of Microsoft, and Microsoft cannot guarantee the accuracy of any information presented after the date of publication. This document is for informational purposes only. MICROSOFT MAKES NO WARRANTIES, EXPRESS OR IMPLIED, IN THIS DOCUMENT. © 2003 Microsoft Corporation. All rights reserved. Microsoft, BizTalk, Windows, and Windows Mobile are either registered trademarks or trademarks of Microsoft Corporation in the United States and/or other countries.